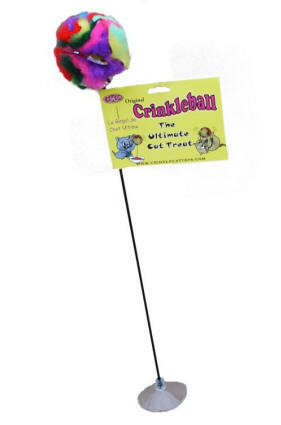 The Crinkle Ball is attached to a 16 inch stick, and the stick is attached to a suction cup. You can stick this toy to any porous surface, and your cat will stay entertained while you are at work. Wow, fun fitness, and exhaustion all rolled into one great toy. The Crinkle Ball will never detach. Your cat will entertain themselves for hours, while they are home alone!